In a 24-page adventure, SpongeBob must save Bikini Bottom from "The Menace of the Mola Mola!" 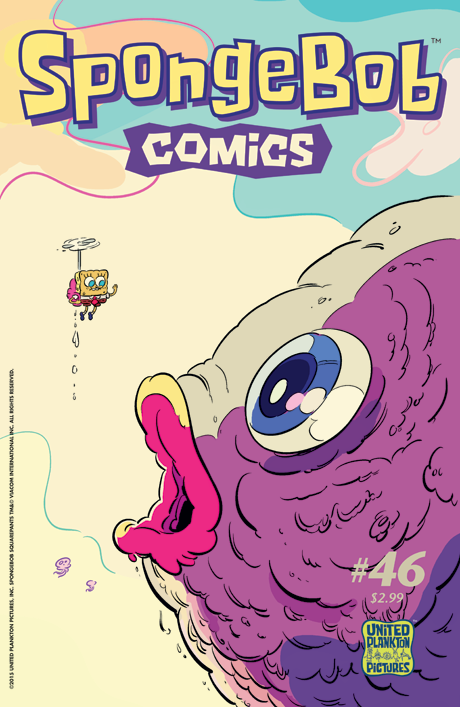 Indy cartoonist Bob Flynn (Nursery Rhyme Comics, Bravest Warriors, Adventure Time) takes our favorite fry cook on a fantastic voyage into the belly of a behemoth–a giant freakish fish that has blotted out the sun and plunged Bikini Bottom into darkness! Can SpongeBob save the day? Also: Patrick searches for the right pet in a comic by Charise Harper (Fashion Kitty); and Plankton shrinks down SpongeBob in a Little Nemo-esque spread by Jed Alexander. Plus the usual James Kochalka (Glorkian Warrior) nuttiness in "SpongeFunnies" and the usual informative aqua-facts by Maris Wicks (Primates)!